The Garmin Approach S4 is a golf-themed smartwatch. 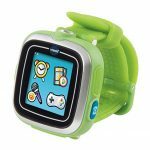 It has a monochrome touchscreen display and integrated GPS to track the wearer�s location. Pre-installed are the course layouts for more than 40,000 golf courses around the world. They can be used to track shots and course progress as you play. 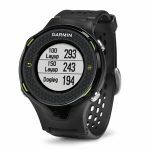 The watch is able to track the precise distance from �the front, back and middle of greens plus layups and doglegs, and detailed stat tracking for better analysis of your game�. It also receives notifications, emails and texts from a connected phone to keep you connected.